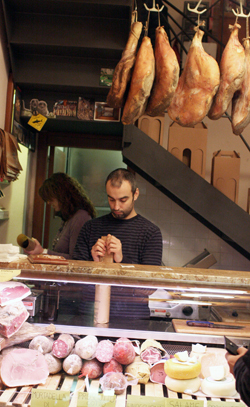 FLORENCE, ITALY – I’m always a little leary of people going outside their expertise. But there was nothing worrisome Saturday night at the historic Antinori Palace restaurant and wine bar. The iconic Italian wine family started a tasting room in the late 1950s – that would be about 600 years after they started making wine. I had visited the Antinori bar about four years ago and found it very attractive, if not a bit stodgy or pretentious. It’s good to report that it was neither Saturday night with a group of 25 folks associated with Wabash College. It proved to be one of the best meals I’ve had in ages, and I’ve had some good ones lately. We did shared appetizers and desserts with everyone ordering their own first (pasta, soup, or salad) and second (steak, veal, vegetable) course. 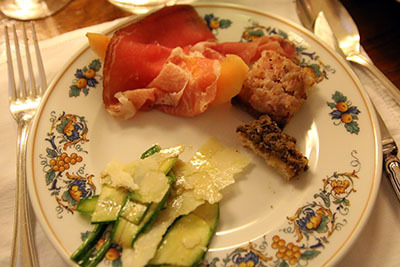 The proscuitto wrapped melon, zucchini salade, and small crostini with several toppings got us off to a strong start with the affordable Antinori Tuscan white. The white wine is widely available in the U.S. I’d never had it before but found it delightful and far about the usual U.S.. price. I had the fresh tomato soup, which had lots of basil and oregano with great texture. 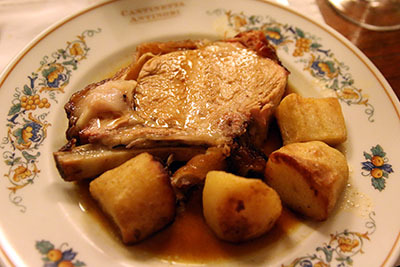 The huge hit for me was the tender, juicy veal with perfectly roasted potatoes. We had a dessert plate of cheesecake with fresh strawberries, biscotti, and a delightful pear cake in a cream sauce. A small sip of the Italian dessert wine Vin Santo and we all went home happy campers. The photos do better than I do at this hour! Wine made from the Sangiovese grape may be the most diverse in the world. The little black grape is closely associated with Italy and rightfully so. But it is also grown in Argentina and California. But in Italy, Sangiovese is king – the most widely planted grape in a country that ships more wine to the U.S. than even France. Perhaps some readers have never heard of the grape? But if you’re a regular wine drinker it’s highly probably you have consumed wines made from Sangiovese. That popular 60s and 70s bottle with the basket covering – that’s Sangiovese. If you’ve ever consumed a Chianti or Chianti Classico in a restaurant or bought a bottle – that’s Sangiovese wine. Perhaps you’ve picked up a Rosso di Montalcino or the high-end Brunello. Both of those wines are Sangiovese. I recently returned from Italy on a business trip and had the opportunity to drink a good amount of Rosso di Montalcino, or ‘baby Brunello’ as some will call it. But first, let’s do some geography for novices. Florence sets in the north central region of Italy. 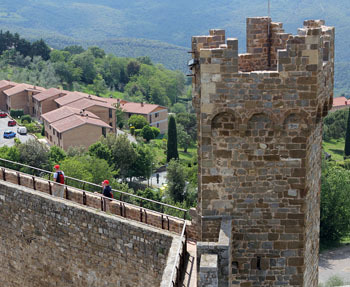 Tuscany starts north of Florence and runs down through Siena. Just south of Florence you find the Chianti region of Italy and at its heart is the Chianti Classico designation. Remember, old world wines from France and Spain are named by region and not the grape. Italian law dictates the blend for Chianti and Chianti Classico has to be 75-100 percent Sangiovese, up to 10 percent Canaiolo and up to 20 percent of any other approved red grape variety such as Merlot, Cabernet Sauvignon, or Syrah. A little farther to the south you enter the Montalcino region, centered around the lovely hilltop town of that name crowned by an ancient castle. The grapes there are also largely Sangiovese. 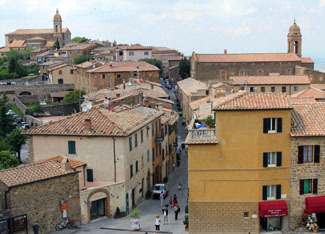 Montalcino is the region for Sangiovese’s best representation in a bottle, Brunello wines. Brunello is 100 percent Sangiovese and must be aged in oak at least two years. The wine tends to be silky smooth and full-flavored with considerable acidity which makes it perfect for food. The problem with Brunello for many consumers is you can barely touch a bottle in the U.S. for $50. Rosso di Montalcino is aged for just one year so you get a wine that is less tannic. The Rosso is richer and easier for wine novices to drink than it’s big brother Brunello. I’m nearing the conclusion that Rosso di Montalcino might be the best value-for-the-money wine that you can pick up off a wine shelf. You can find Rosso wines anywhere from $15-$30. There are plenty of great selections at $15-$20. You’ll get a great food wine but also a wine that can be sipped. The taste will have a smooth and often silky flavor. It will feature a recognizable cherry flavor from the great Chianti-styled Sangiovese wines. It will be less tannic and more rewarding for novice wine drinkers. Sangiovese wines are great with red sauce Italian dishes, pizza and red meats. Rosso di Montalcino is a wine you might never find in a supermarket and few liquor stores, but it’s worth the search. Most wine shops with a good selection of Italian wine will have a few bottles of Rosso di Montalcino. Howard W. Hewitt, Crawfordsville, IN., writes every other week about wine for 18 Midwestern newspapers. Working in communications and marketing does have a few perks. My work at Wabash College in Central Indiana affords me the opportunity to do some travel with college programs. It actually is work but I’d be lying to say it’s not a pretty cool assignment. A communications person accompanies some of these trips to blog, take photos and document the trips to help promote future alumni travel and our classroom-based immersion learning programs. I hope to post here, probably brief updates, throughout the next week. It’s a two-week trip but I’ll be along for just the first week. We’ll land in Pisa Friday morning, then spend five days in the charming city of Pisa, just south of Florence. The group packs up and heads south again to Assisi for a four day stay but I’ll be off to Rome and back home during the second day in Assisi. The travel group continues on to Florence before returning home. Besides enjoying the great food and wine of Italy, I’m really looking forward to Tuesday when we visit Montalcino, of course the center of all things Brunello. So throughout the week I’m going to try to do quick wine posts and some photos. I will be writing daily for a work blog and that takes first priority. If you want to see what alumni travel looks like you can follow along on the blog I’ll be maintaining during the trip – Cartolina dall’ Italia – or Postcard from Italy.